It's March? It's March!! I can come out from hiding!! I don't know what it is about February that gets me every year. Additionally, there's some sort of memory loss involved because it takes me until the tail end of February to realize that what I'm feeling is just normal February-ness. So I am ecstatic because today is the first day of March and I am already feeling better!! Actually, I tried to feel better yesterday, but Leap Year tricked me. Why do we have to have Leap Day on a Monday? It's like being punished with an extra Monday. Wouldn't Leap Day on a Saturday have been better?? I digress. We are starting March out on the right foot. It's Tuesday Ten time and I'm writing again. I have posts planned and things to say! I feel like I am just waking up out of a fog. I love March!! It's really my most favorite month!! Want to know why? Of course you do!! My birthday!! It's the 13th, in case you're new here. I love my birthday. It's my own special holiday. I don't even mind sharing it with a couple of people I went to high school with. As long as you aren't worn out from celebrating my YOUNGER brother's birthday the day before, I'll be happy! Spring! The weather can be awfully finicky in March, but I don't care because by the end of it we are officially in Spring. The weather warms up. The sun sticks around a bit longer. Trees leave. I mean, they don't go anywhere....their leaves come out. Flowers bloom. Yay!! With an improvement in the weather, my house gets a break. The kids can finally play outside again and I don't have to worry about as many messes inside (except when they track mud in with them...) They call yell and scream and run around, just like they try to do inside all winter! Exercise! I hate the cold and I hate being outside when it's cold. When the weather warms up I can spend more time outside moving around. I can get some of those exercise endorphins that make you feel good! Easter! Now, I know that Easter is not always in March, but it sometimes is, and this is one of those years. Easter is my favorite holiday and I love celebrating both the religious and secular aspects of it. Spring Break! I'm not listing this for the reason you think I am. The kids' spring break throws me off. I have to figure out what to do with them for a whole week while I'm at work. That's stressful. What I like is JMU's spring break. I don't get the week off, but it's more quiet around here, and we do get a day off out of it. A day when my husband is working and my kids are in school. It's an actual day off for me. Between getting the kids to school and getting them back from school, I have a day to myself. That's rare! unrelated, but relevant picture of how I feel when I get time to myself! Green! The color of March seems to be green. Trees, flowers, grass, St. Patrick's Day, etc. And green is my favorite color. I get to be surrounded by all different shades of my favorite colors! Summer programs open up. If spring break is stressful for a working parent, then summer break is 10 times worse. Really! I literally have 10 weeks worth of care and entertainment to nail down for my kids. But March is when camps start opening up and I can start making plans. This makes me slightly less stressed. Paint Nite! Have you seen these fun paint nite gatherings? People get together and each paint a canvas with some artistic direction from the leader. I've seen tons of friends post their pictures and then I saw one in my area on my birthday! It was a really cute picture too. Unfortunately, by the time my BFF and I got our plans together that one was sold out, but we were already so excited that we just picked a different night and signed up for that. Now I don't even remember what we're painting, but Julie and I are getting out of the house for a night together and that's the important part! I'm writing! I really can't explain why nothing was coming to me for February. I had ideas and everything, I just couldn't make myself write anything. And now that's it March, I can write again. Like flipping a switch! Hooray! Tuesday Ten is a fun linkup created by Lisa @ The Golden Spoons and Rabia @ TheLiebers. 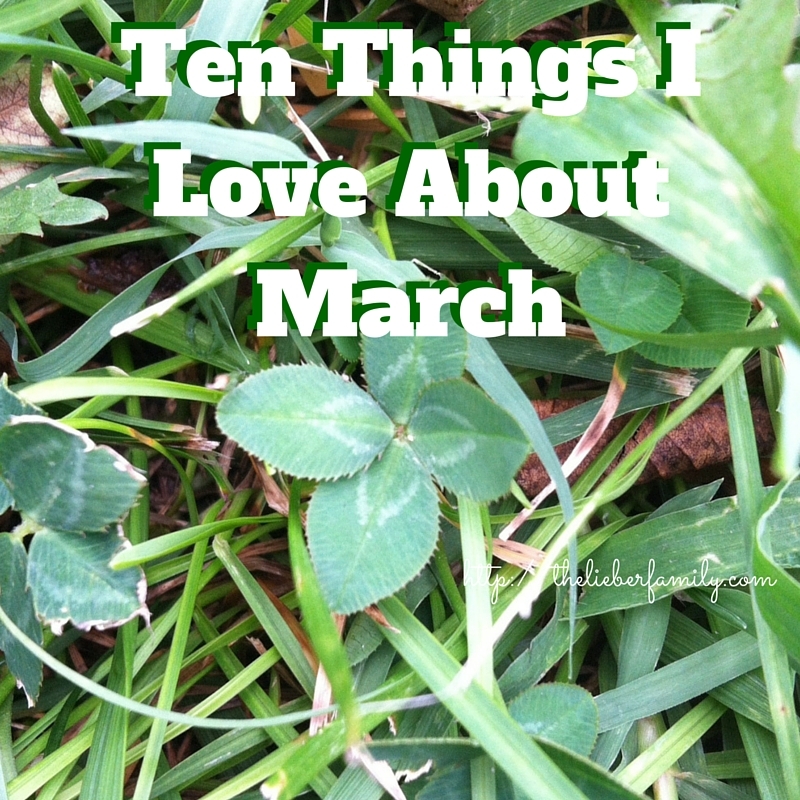 The first Tuesday of each month we make a list of ten things and link them up to share. Any topic works! Anyone can join in! If you would like to be added to the mailing list without linking up, click here. We hope to see you on Tuesday! 1) Link up a post, old or new, and add our TuesdayTen button to your post or sidebar.